Hide your wallet! published on May 11, 2015 Rachel9 Comments on Hide your wallet! We both very much enjoy the reviews of Shut up & Sit Down, but they can be quite harmful for our wallets. I believe that it was their review of Netrunner that sparked our interest and enthusiasm for the game. Also Sherlock Holmes Consulting Detective, Dead of Winter and Seasons! And probably some other games as well. 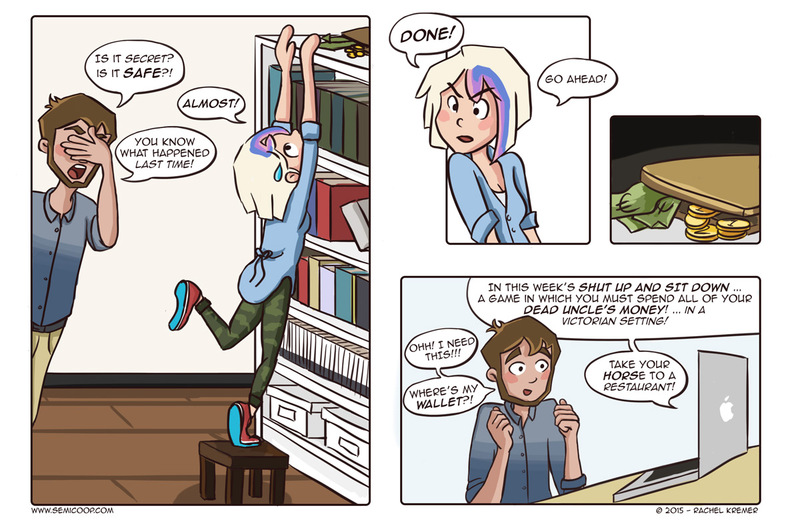 The game that is mentioned in this comic is the game Last Will . We haven’t played or bought it yet, thanks to excellent wallet-hiding skills, but it is certainly on our list of games we still like to play one day. If you have never heard of Shut Up & Sit Down (and you’re interested in board games), you should totally check out their website: http://www.shutupandsitdown.com/. But remember to hide your wallet! Which games did you almost immediately buy after seeing the Shut Up & Sit Down review? X-Wing. Bloody X-Wing. George Lucas had successfully clubbed all my remaining Star Wars nostalgia to death and I was perfectly happy admiring X-Wing’s nice miniatures from afar. Then bloody Shut Up And Sit Down did a bloody video review and made it sound awesome and now I have mumblemumble pounds of plastic spaceships and third-party acrylic tokens and oh god I need help. Ouch, that must -really- hurt your wallet. 😀 X-Wing is certainly also on my to-play list, but not really on my to-buy list… so I’m just going to have to become acquaintance with somebody who already owns an entire fleet. The list is long, and just for almost buying, but actually doing it. Witness (and then Sherlock as it was back in stock) was 1 min into the vid. Amazon uk had only 3 left in stock at that point. i moved fast because I knew i had too. SU&SD effect on stock, is fast and powerful. I own Netrunner (2core and lots of expansions) because of them. Friends have many of the others. Our system for storing them in an organised way, is to make board game ownership a co-op activity. This exact thing happened. With this exact game. Except I bought it. Thanks, Shut Up and Sit Down! Oh jeez, I fully understand. Lessee, things I’ve bought before the video has gone live would be Witness and Sherlock Holmes: Consulting Detective (I love me some co-operative mysterying, apparently). Things I’ve bought immediately after… uh. Too much. Tooooo much. My poor wallet. This is a running joke between my gaming friends and I. You can tell the point that one of us listens to a podcast/watches or reads a review by the messages we leave in our FLGS’s FB page. Most of my fairly early-days collection, basically! But Netrunner is the biggest, both in terms of my enjoyment and hours played, but also for introducing me to most of the people that now make up my primary board game group. Thanks SU&SD! I bought Welcome to the Dungeon entirely based on their review! Most of it ends up on my wishlist almost immediately, but Sherlock was an immediate buy. Haha, yes, same here! We only play it once or twice a year with our friends so we still have two cases to go. But with all the expansions that are available now, there’s enough Sherlock Holmes for us to play for the coming ten years!